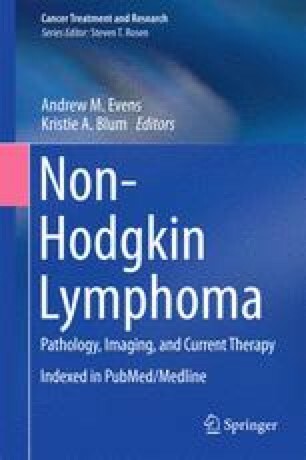 Marginal zone lymphomas (MZL) represent around 8 % of all non-Hodgkin lymphomas. During the last decades a number of studies have addressed the mechanisms underlying the disease development. Extranodal MZL lymphoma usually arises in mucosal sites where lymphocytes are not normally present from a background of either autoimmune processes, such as Hashimoto thyroiditis or Sjögren syndrome or chronic infectious conditions. In the context of a persistent antigenic stimulation, successive genetic abnormalities can progressively hit a B-cell clone among the reactive B-cells of the chronic inflammatory tissue and give rise to a MALT lymphoma. The best evidence of an etiopathogenetic link is available for the association between Helicobacter pylori-positive gastritis and gastric MALT lymphoma. Indeed, a successful eradication of this micro-organism with antibiotics can be followed by gastric MALT lymphoma regression in more than 2/3 of cases. Other microbial agents have been implicated in the pathogenesis of MZL arising in the skin (Borrelia burgdorferi), in the ocular adnexa (Chlamydophila psittaci), and in the small intestine (Campylobacter jejuni). The prevalence of hepatitis C virus (HCV) has also been reported higher in MZL patients (particularly of the splenic type) than in the control population, suggesting a possible causative role of the virus. In non-gastric MALT lymphoma and in splenic MZL the role of the antimicrobial therapy is, however, less clear. This review summarizes the recent advances in Marginal Zone Lymphomas, addressing the critical points in their diagnosis, staging and clinical management.